Depeche View Pro - View, search and edit all text of a folder very fast. Ideal for source code. 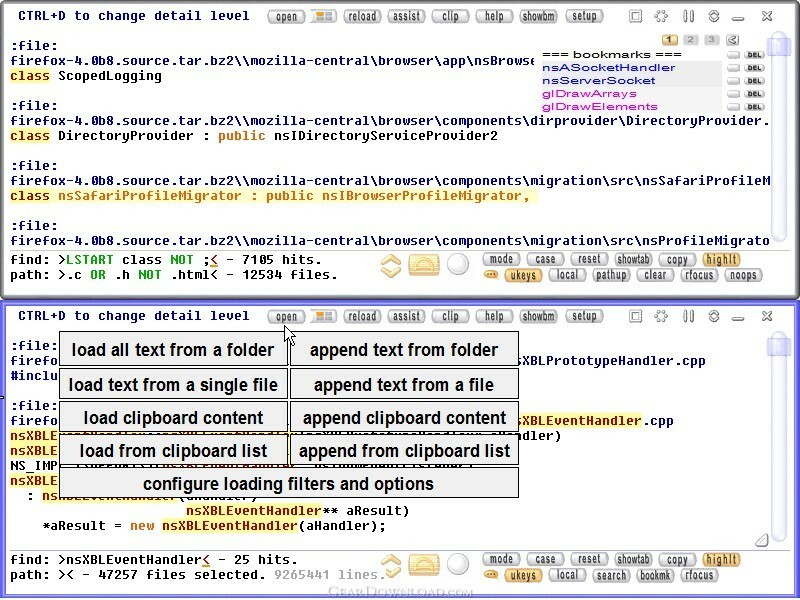 View, search and edit all text of a folder in one window, with the least possible mouse clicks and key presses. Search a phrase just by clicking on it. Fly over text by dragging the mouse. Edit and copy text, and create bookmarks with the same ease. View text within .zip, .tar.gz, .bz2 archives instantly. If you have to read through many small ASCII text files, e.g. source code, this tool allows text analysis at extreme speeds. For example, to search a word, forget about opening a dialogue, setting options, clicking through results lists to open one result file after another. No, just type the word - and see all matching text lines, instantly. Then, if you see another word of interest, don't even type it - click on it! And again, you will see all matches, instantly, no matter in what file. Further features include search autosuggest, clipboard content loading, fast search of tab separated CSV data, user extendable syntax highlighting, user scripts on hot keys. What's New: added script commands to control network text display by own scripts. This download (DViewProDemoSetup.exe) was tested thoroughly and was found 100% clean. Click "Report Spyware" link on the top if you found this software contains any form of malware, including but not limited to: spyware, viruses, trojans and backdoors.